Arranged for soloists, choir and organ. Composed by Wolfgang Amadeus Mozart (1756-1791). Arranged by Martin Focke. Stapled. Choir & Organ. Organ reduction. K. 317. Baerenreiter Verlag #BA07519. Published by Baerenreiter Verlag (BA.BA07519). ISBN 9790006526345. 27.2 x 19.2 cm inches. Key: C major. 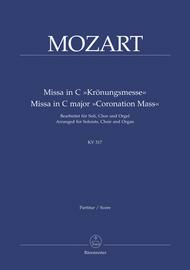 Composed in 1779, Mozart'sCoronation Massin C major, K. 317, is one of the most popular settings of the Ordinary, thanks to its festive character and the wealth and variety of its musical ideas. 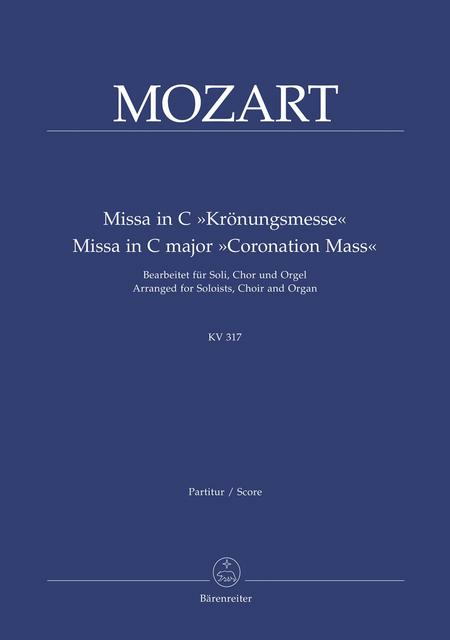 This arrangement for solo voices, chorus and organ is based on the Urtext of the New Mozart Edition and makes the work available in all its radiant beauty to choruses and church choirs with limited financial resources. Theconcertanteorgan part, prepared by Martin Focke from Mozart's orchestral accompaniment, does full justice to the beauty of the original.